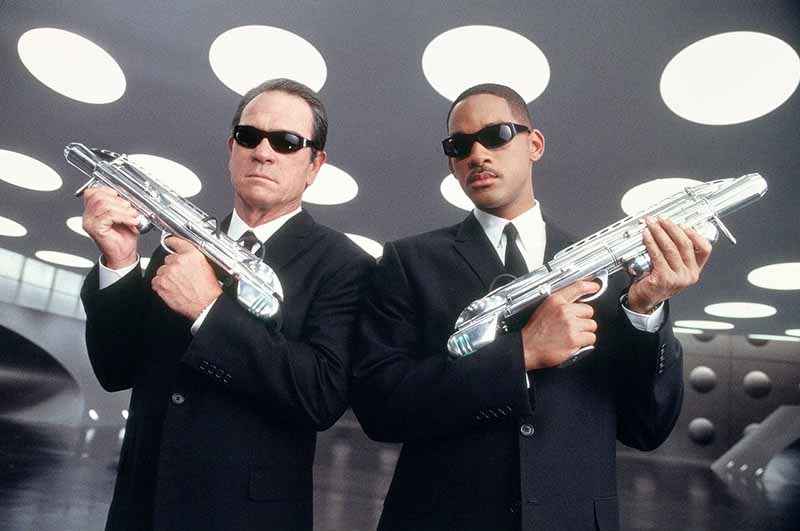 Men in Black (MIB), in American popular culture and in UFO conspiracy theories, are men dressed in black suits who claim to be government agents who harass or threaten UFO witnesses to keep them quiet about what they have seen. It is sometimes implied that they may be aliens themselves. The term is also frequently used to describe mysterious men working for unknown organizations, as well as to various branches of government allegedly designed to protect secrets or perform other strange activities. The term is a generic one, used to refer to any unusual, threatening or strangely behaved individual whose appearance on the scene can be linked in some fashion with a UFO sighting. Early reports of Men in Black often described them as men of short stature with swarthy complexions, as if they were deeply tanned. They are also described as just normal people with dark suits and any colored skin. Some reported them as Gypsies. Sunglasses, black suits and black cars have been a feature for the entire period since modern sightings began in 1947, but according to UFO historian Jerome Clark, "All MIB are not necessarily garbed in dark suits." Some report that MIB all look alike. Their often mechanical behavior has caused them to be described by some as being like robots or androids. Their voices are monotone and their faces emotionless. They speak in a dull monotone voice, like a computer, and are dark-complected with high cheekbones, thin lips, pointed chin, and eyes that are mildly slanted. According to the accounts of those reporting encountering them, Men in Black always seem to have detailed information on the persons they contact, as if the individual had been under surveillance for a long period of time. They have been described as seeming confused by the nature of everyday items such as pens, eating utensils or food, as well as using outdated slang, though accounts on the behavior of Men in Black vary widely. Accounts indicate that they often claim to be from an agency collecting information on the unexplained phenomenon their subject has encountered. In other accounts, they seem to be trying to suppress information by, for instance, trying to convince their subject the phenomenon never existed. They have been described as behaving in either an exceedingly furtive manner or a completely outgoing one, with wide grins and disconcerting giggles. In the UFO research community the Men in Black often claim to be from the U.S. Air Force, CIA or the FBI. Those who have encountered them say they produce identification, but when verification is later sought, the people described either do not exist, have been dead for some time, or do exist but have a different rank. The men in black purpose: to hide and suppress advanced technologies and information about extraterrestrial activities if any for the sake of national and world security. They allegedly travel in groups of three, but are sometimes alone. The are usually seen driving black mint-condition late model luxury cars such as Cadillacs or Lincolns. Their cars often operate with the headlights off, but ghostly purple or greenish glows illuminate the interior. Unusual insignia have been seen emblazoned on the doors and the license plates are always unidentifiable or untraceable. Many have reported seeing these vehicles after a reported UFO sighting, ET abduction, or crop circle finding. Some people believe the MIB are government agents. Some people believe that are extraterrestrials. There have been reports of MIBs following people around in black helicopters. The first reported occurrence of Men in Black was allegedly Albert K. Bender, the editor of a flying saucer publication called the Space Review. In the October 1953 issue he placed an announcement stating that he had come across information that would solve the flying saucer mystery but could not print it because he was ordered not to. He ended the announcement warning others in UFO research to be very cautious. He then stopped publication. Later in an interview Bender stated that three men wearing dark suits had ordered him to stop publishing UFO material, and that he had complied with the order because he had been "scared to death" of them. He later published a book called Flying Saucers and the Three Men in Black.